The Washington D.C. government justified spending taxpayer dollars on an anti-catcalling display by claiming women run into the street to avoid whistling and catcalls. WAMU reports Washington D.C. unveiled “The Walkway” as part of the District Department of Transportation’s and Mayor Muriel Bowser’s “Vision Zero" project to reduce traffic fatalities in the city. WAMU describes the tunnel as “hot pink ramp with bright, color-changing lights” that includes audio of people whistling and catcalling. The display also includes photos of people who have allegedly been forced to endure the trauma of being catcalled, as well as quotes about their experiences. “We’re trying to represent everyone,” she continued. The information obtained by the survey will be incorporated into the project. Participants are prompted to answer whether they have ever been exposed to “comments or actions” in public that were “harmless, flattering, annoying, disturbing, or threatening?” In other words, they ask, has anyone ever spoken to you in public? The website defines the words “harmless,” “flattering, “annoying,” “disturbing,” and “threatening” and then asks survey participants whether they have been the subject to 23 different scenarios and how those situations made them feel. Participants are offered to share their own stories with street harassment and claims responses will be anonymous. Jonathan Rogers from the Department of Transportation rationalized the anti-catcalling display by alleging people are apparently so afraid of being whistled at in public that they can run the risk of running into the street and being killed by a driver. “That’s actually a problem for people,” Rogers reasoned. 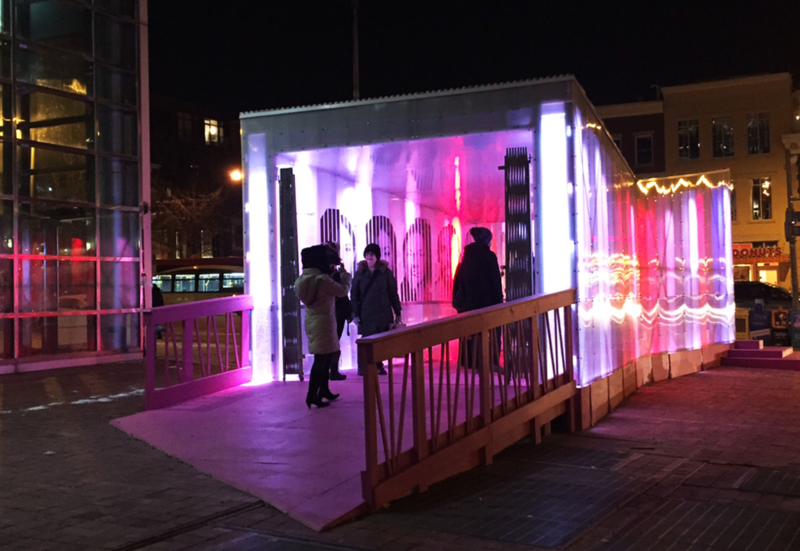 Even though the purpose of the project is to try to end street harassment, Jessica Raven, the executive director of Collective Action for Safe Spaces, told DCist that the display is actually triggering. She claimed the shouts and catcalls that are part of exhibit could allegedly be harmful. Raven said people can “hear the honking and comments” from outside the exhibit. The D.C. Department of Transportation summary claims $156,000 went to the Department of Public Works, $103,000 went to the District of Columbia Public Schools, $100,000 went to the Office of Disability Rights, $80,000 went to the District Department of Transportation, and $61,000 went to the Deputy Mayor for Health and Human Services. The budget for the “Zero Street Harassment Project” grant was $41,000. It was created in partnership with the District Department of Transportation, the D.C. Commission on the Arts and Humanities, and Age-Friendly D.C for Vision Zero. According to WAMU, the Vision Zero project has had no impact on traffic fatalities in the city. The exhibit will run in D.C. until March 1.